While we anxiously await the Minor League all-star announcements, I wanted to share a few layouts I made at the end of May for Blake's album. For most of the season, Blake had played catcher and has done a great job! One game he had a very close call against one of his best friends from school. The boy was called safe. 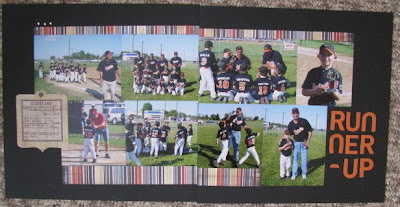 At our next game, the boys grandmother stopped me and gave me an envelope with pictures she'd taken from the game they'd played against each other. We joked that she had the instant replay! I made these two layouts using the WRMK "MVP" line. I also pulled out some photos of Blake's first year of Rookie league. Three years ago...he was Kevin's age. Man, he's grown! Finally, here is a non-baseball LO, but it's for Blake's album. 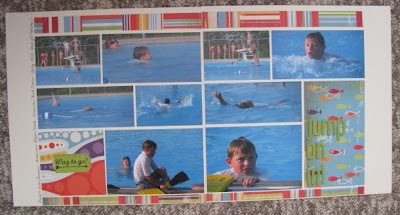 These photos are from his swim lessons last summer. He has become a really good swimmer - not bad for a kid with a mom who is terrified of water! I am really enjoying having both my boys out of school for the summer. I'm afraid this might be the last summer that I can look down to Blake though. He's growing up fast! 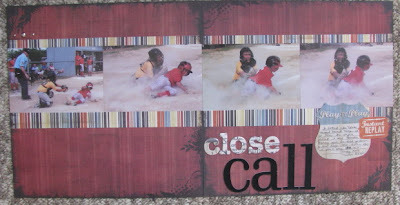 Great layouts Amy...it is wonderful to see how you combine your love for scrapping with your love of the sport.